Funny how life takes you around in a circle. If you’re not careful, it will do it to you time and time again, making you dizzy. And not a good kind of dizzy like you get from swinging your grand-daughter around. Her peals of laughter making your pulse rise, making your heart feel like it’s beating through your chest; your lungs expanding as the world whirls by, faster and faster keeping pace with your breathing. And when you stop, you find you cannot move, for up and down has been displaced. But, you find you have each other to cling to. You have each other to laugh with. And slowly the kitchen stops rolling by and all settles back into its rightful place. The stove, still and squat, sits black and glum; the fridge looms over you in its stolid silvery stance. The granite countertop, mottled in black, silver and gray, no longer appears as though numerous nickels and dimes have been lodged within it. You know it’s not really there, but you have caught yourself countless times reaching over to pick up that coin. Laughing at yourself, you swear it’d been blinking and twinkling at you. And like a mirage, it evaporated the minute you tried to touch it. It was nothing more than a silvery spot reflecting the brightness of the overhead lighting. The countertop plays tricks on your eyes, just like the twirling plays tricks on your brain. Just like life plays tricks on your psyche. You think up is one way and it turns out, no; it’s down. Left is right and right is wrong. And no matter how you twist and twirl, you can’t make it go right side up. Or is it downside up? Life is a carousel. 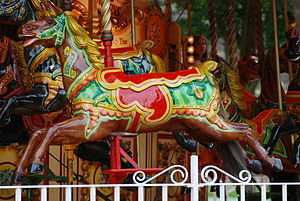 A merry-go-round that is sometimes not so merry. If you’re lucky, you get a bench seat and a relaxing ride. But if you draw a bucking pony, you must needs hang on tight as the world whizzes by. Round and round it goes and where it stops, nobody knows. This entry was posted in Coping, Resilience on June 28, 2012 by Irma. what a perfect analogy! indeed there are times when I feel like my life is one continuous circle! I’m grateful for the moments when my head stops spinning!